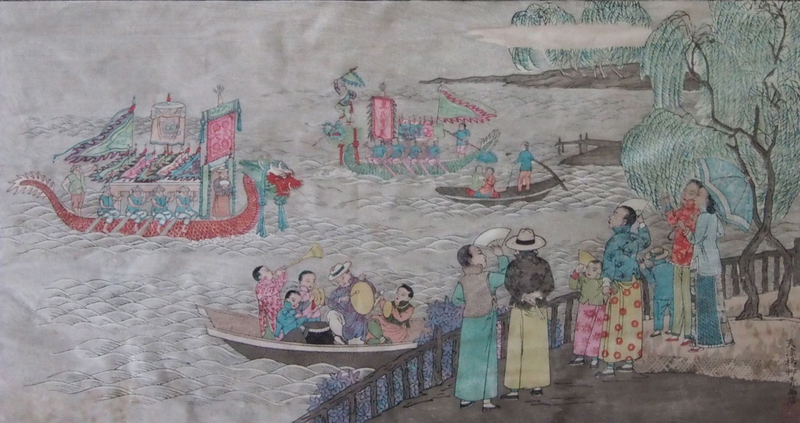 This Yang Liu Qing wood block print depicts a scene of the Duan Wu Festival where the dragon boat race is taking place. From the costume, it would be a time of the Republic of China period, the cue hairstyle has gone, the appearance of western style hats. The dragon boat race began as a rescue operation of the respected Qu Yuan who leaped into the river to kill himself. Fisherman gathered ringing gongs to scare the fish away, feeding them zong so they will not harm him. Hundreds of years later, it came a festival that attracted even the Emperors would participate viewing the race. Today is 5th of lunar May, and you have probably feasted on the traditional dumpling (zong) over the past few days. The Hong Kong Dragon Boat Carnival will take place on this weekend and this year it have the setting of the Victoria Harbour. Click here for more details.